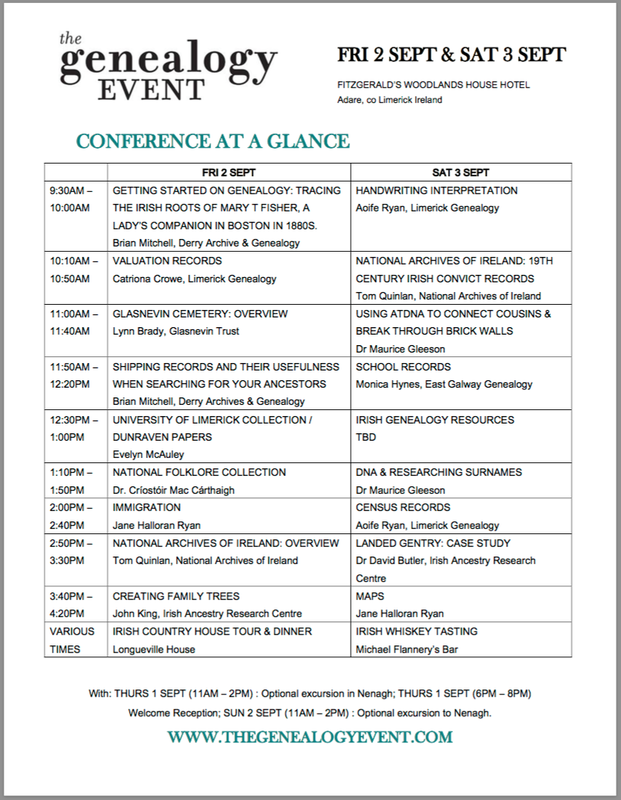 If you are going to be around for the Gleeson Clan Gathering (19-24th August), you might like to consider also going to The Genealogy Event. This is the third year of this popular event and it runs from September 2nd to 3rd in the wonderful FitzGerald's Woodlands Hotel on the outskirts of Adare, one of the most picturesque villages in Limerick. 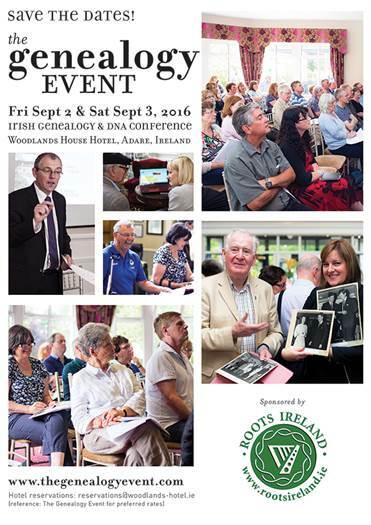 The event is sponsored by www.RootsIreland.ie. 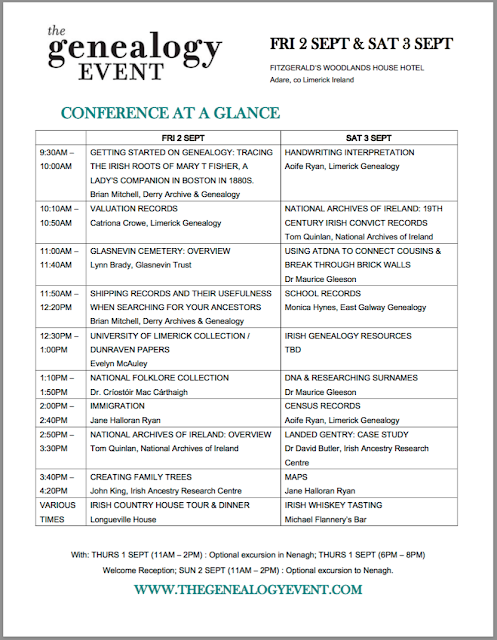 Limerick Genealogy, in tandem with several other genealogy centres will offer once again the popular and complimentary 20MIN consultations to ticketed attendees. This is an excellent opportunity to direct queries against your specific research interests and gain some useful tips and recommendations. Sign ups for these appointmentes will occur both in advance of the event and on-site and are on a first come first serve basis. Notifications will occur via email and to the email address used to purchase tickets. The special events offer the opportunity to engage with others amid local and special interest destinations. In past years special events have included welcome BBQ receptions, a morning excursion to the 200 year old Milk Market, a night out at the races, a Georgian style party, Desmond Castle tour & dinner in an 1820s thatched roof cottage, 1826 in Adare Village, a garden tour and evening dinner at an Irish country house, Mustard Seed and tour of Adare Manor and lunch. This year, there will be a welcome reception on the Thursday, a dinner and house history at Longueville House plus a whiskey history, tasting and Nenagh town and castle tour. Please see ticket options for additional info. I attended this event last year and thoroughly enjoyed it. I will be speaking again this year and look forward to re-establishing old relationships.